Heat oven to 350°F. Grease bottom and side of springform pan, 9x2 inches, or round pan, 9x1 1/2 inches, with shortening. In medium bowl, beat 1/2 cup sugar, the butter and egg with electric mixer on low speed about 30 seconds or until smooth. Beat in Bisquick. Spread over bottom and 1 inch up side of pan. In small bowl, mix yogurt and egg until smooth. Stir in apple; spoon over batter in pan. Mix 1/4 cup sugar and the cinnamon; sprinkle over apple mixture. Bake 45 to 50 minutes or until center is set and crust is deep golden brown. Cool 10 minutes; remove side of pan. Serve warm. Drizzle with a glaze made by mixing 1/2 cup powdered sugar and 1 to 2 tablespoons milk until smooth and thin enough to drizzle. A kuchen is a fruit- or cheese-filled yeast-raised cake, usually served for breakfast but also enjoyed as a dessert. It originated in Germany. 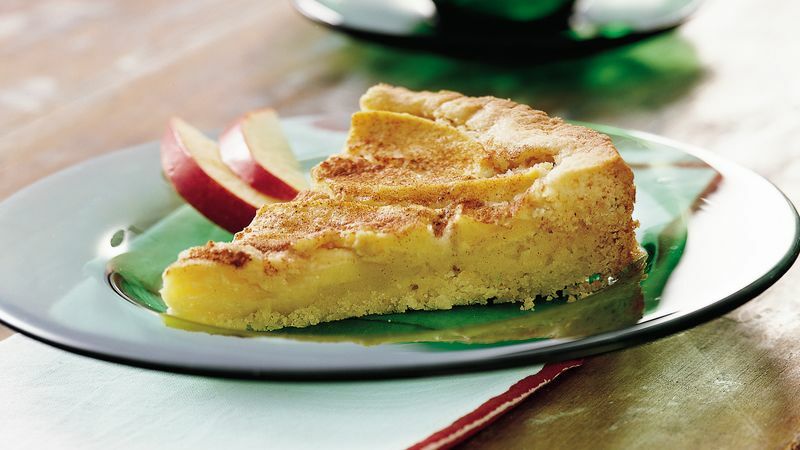 We've simplified the traditional yeast-raised kuchen by using Bisquick to make a delicious crust.